I heard that at the end of the Kali Yuga, the world will be destroyed. Will the Earth be destroyed or will the entire Universe be destroyed? Lord Kalki will appear in the home of the most eminent brāhmaṇa of Śambhala village, the great soul Viṣṇuyaśā. 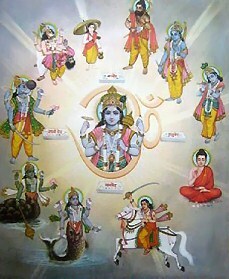 Lord Kalki, the Lord of the universe, will mount His swift horse Devadatta and, sword in hand, travel over the earth exhibiting His eight mystic opulences and eight special qualities of Godhead. Displaying His unequaled effulgence and riding with great speed, He will kill by the millions those thieves who have dared dress as kings. After all the impostor kings have been killed, the residents of the cities and towns will feel the breezes carrying the most sacred fragrance of the sandalwood paste and other decorations of Lord Vāsudeva, and their minds will thereby become transcendentally pure. When Lord Vāsudeva, the Supreme Personality of Godhead, appears in their hearts in His transcendental form of goodness, the remaining citizens will abundantly repopulate the earth. When the Supreme Lord has appeared on earth as Kalki, the maintainer of religion, Satya-yuga will begin, and human society will bring forth progeny in the mode of goodness. When the moon, the sun and Bṛhaspatī are together in the constellation Karkaṭa, and all three enter simultaneously into the lunar mansion Puṣyā — at that exact moment the age of Satya, or Kṛta, will begin. At the end of the day, under the insignificant portion of the mode of darkness, the powerful manifestation of the universe merges in the darkness of night. By the influence of eternal time, the innumerable living entities remain merged in that dissolution, and everything is silent. When the night of Brahmā ensues, all the three worlds are out of sight, and the sun and the moon are without glare, just as in the due course of an ordinary night. The devastation takes place due to the fire emanating from the mouth of [Ananta], and thus great sages like Bhṛgu and other inhabitants of Maharloka transport themselves to Janaloka, being distressed by the warmth of the blazing fire which rages through the three worlds below. At the beginning of the devastation all the seas overflow, and hurricane winds blow very violently. Thus the waves of the seas become ferocious, and in no time at all the three worlds are full of water. The Supreme Lord [Vishnu] lies down in the water on the seat of Ananta, with His eyes closed, and the inhabitants of Janaloka offer unto the Lord their glorious prayers with folded hands. And by the way, all this annihilation is overseen by Shiva god of destruction, who engages in his cosmic Tandava dance in order to direct all this destruction. After the Pralaya is over, Brahma wakes up and commences the creation of the three worlds again, and thus a new Kalpa begins. Now a Kalpa is already an incredibly long period of time, but it's just one day in the life of Brahma. Now imagine how long a hundred years is in the life of Brahma! That is how long Brahma lives for, and it's called Mahakalpa. And after the Mahakalpa is over, Brahma dies, and then there is a period of even greater destruction, the Mahapralaya, which lasts as long as Mahakalpa. And then Brahma is reborn, marking the start of a new Mahakalpa. And the cycle begins again! All the four yugas combined together is called a Maha Yuga. One Maha Yuga comprises of 43,20,000 years. 1000 maha yugas are equivalent to the day time of the Brahma. Brahma’s night is also of the same time. So Brahma’s one full day is equivalent to 864,00,00,000 human years. Brahma’s one second is equivalent to 1,00,000 human years on earth. Brahma lives like this for 100 years (in human years 864,00,00,00 x 365 days x 100 years), and the entire life time of brahma is equivalent to one breath of Sri Maha Vishnu. It is said that when Sri Maha Vishnu exhilirates, the entire world is created, and when he annihilates the entire world is destroyed. The timespan between his exhiliration and annihilation is equivalent to 100 years for Brahma. The Vishnu Purana states that at the end of the daytime period of Brahma, a dreadful drought will occur that will last 100 years, and all the waters will dry up. The Sun will change into seven Suns, and the three worlds (Bhurloka or Earth, Bhuvarloka or the lowest heaven, and Svargloka or the next higher heaven) and the underworlds will be burned bare of life. The inhabitants of Bhuvarloka and Svargloka flee to the next higher heaven, Mahaloka, to escape the heat; and then to the next higher heaven, Janaloka. Then mighty clouds will form and the three worlds will be completely flooded with water. Lord Vishnu reposes on the waters in meditative rest for another whole kalpa (4.32 billion years) before renewing the creation. The destruction that takes place at the end of a daytime of Brahma is referred to as 'naimittika', which is incidental or occasional. The characteristic of this destruction is that the three worlds continue to exist but are made uninhabitable. The souls of individuals also continue to exist to be reincarnated in the next daytime of Brahma. We are currently in the age of Ascending Dwapara Yuga and not in Kali Yuga. This astonishing revelation was made by Sri Yukteswar Giri(Guru of Paramahansa Yogananda) in his book "The Holy Science" published in 1894. According to Sri Yukteswar, ages work in full solar cycle of 24000 years. It contains 2 periods, ascending arc and descending arc of 12000 years each. The period of 1200 years is Kali Yuga, the period of 2400 years is Dwapara Yuga, the period of 3600 years is Treta Yuga and the period of 4800 years is Satya Yuga. If you add these, it completes one arc. We are currently in the ascending arc which means after the current Dwapara Yuga, we will enter Treta Yuga. In descending arc, Treta Yuga comes after Satya Yuga, Dwapara Yuga comes after Treta Yuga and Kali Yuga comes after Dwapara Yuga. When we reach the end of Kali Yuga of descending arc, we progress into another Kali Yuga of 1200 years but this time in ascending arc which means the next age will be Dwapara Yuga then Treta Yuga and then Satya Yuga. The 2 Kali Yugas of both descending and ascending arc have passed already. Most of the people believe that we are in the age of Kali Yuga because of the wrong calculations of certain Sanskrit scholars such as Kulluka Bhatta. That's why the length of the yugas has been widened and that is also the reason why you get wrong figures like 4,32,000 years of Kali Yuga. I recommend you all to read "The Holy Science" by Sri Yukteswar which in detail explains why we are in Dwapara Yuga and why and how we got the wrong figures which most people believe. Please note the period in which Sri Krishna lived on earth was also Dwapara Yuga but that Dwapara Yuga was in descending arc and the current Dwapara age in which we live is in ascending arc. There are 3 gunas or qualities called -Satva, Rajas and Tamas. Entire creation is made up of them only. There are 4 yugas making a cycle, namely Satya Yuga, Treta, Dwapar and Kaliyug. Satya Yuga is dominated by Satva guna that is truth(satya), meditation(tapas), purity(shauch) and worship(bhakti). In treta (3 feets), truth is given up my people because of increased Rajas and left with 3 qualities of Satva. In Dwapar, meditation is also given up by people, leaving dharma standing on 2 qualities and hence called Dwapar(2 feets). Finally, in kaliyug, purity is also lost under the effect of Tamas, leaving only Bhakti. By the end of Kaliyug, bhakti also vanishes and there is no discipline but chaos. Than Lord Vishnu appears in the form of Kalki and reestablishes the four qualities of Satya yuga, and once again Satya yuga is established. Only adharmis, mlecchas are destroyed, not the universe. We are currently about 5100 past years within Kaliyuga of 28th chaturyug, 7th manavantar of Varah Kalpa. Prajapati Brahma ji is now about 50 years old and he has remaining more 50x360 approx. kalpas of his life, that is about 18000 more kalpas, where each kalpa has 1000 chaturyugs. 1 chaturyuga = 43,20,000 earth years. The Chaturyuga ages, i.e. Satya, Treta, Dwapar and Kaliyug see a gradual decline of dharma, wisdom, knowledge, intellectual capability, life span, emotional and physical strength. Satya Yuga:- Virtue reigns supreme. Human stature was 21 cubits. Average human lifespan was 100,000 years. Treta Yuga: – There was 3 quarter virtue & 1 quarter sin. Normal human stature was 14 cubits. Average human lifespan was 10,000 years. Dwapar Yuga: – There was 1 half virtue & 1 half sin. Normal human stature was 7 cubits. Average human lifespan was 1,000 years. Kali Yuga: – There is 1 quarter virtue & 3 quarter sin. Normal human stature is 3.5 cubits. Average human lifespan will be 100 years. Towards the end of the Yuga this will come down to 20 years. In the present days we live in a Kali Yuga, which began at 3102 BCE with the end of the Mahabharata war. This date is also considered by many Hindus to be the day that Krishna left Earth. Not the answer you're looking for? Browse other questions tagged yuga time kali-yuga lokas pralaya . Which Pralaya is the final destruction of the Universe(big crunch)? Is Kali yuga the last yuga of the world?